Elara Pro comes with a built-in Recipe shortcode [lt_recipe] that displays recipes in a Google friendly format. The Recipe Card button gets disabled automatically with the new WordPress 5+ version if you're using the "blocks" editor. In order to keep using your recipe card feature, use the Classic Editor. Learn more here. See a demo for the recipe card here. 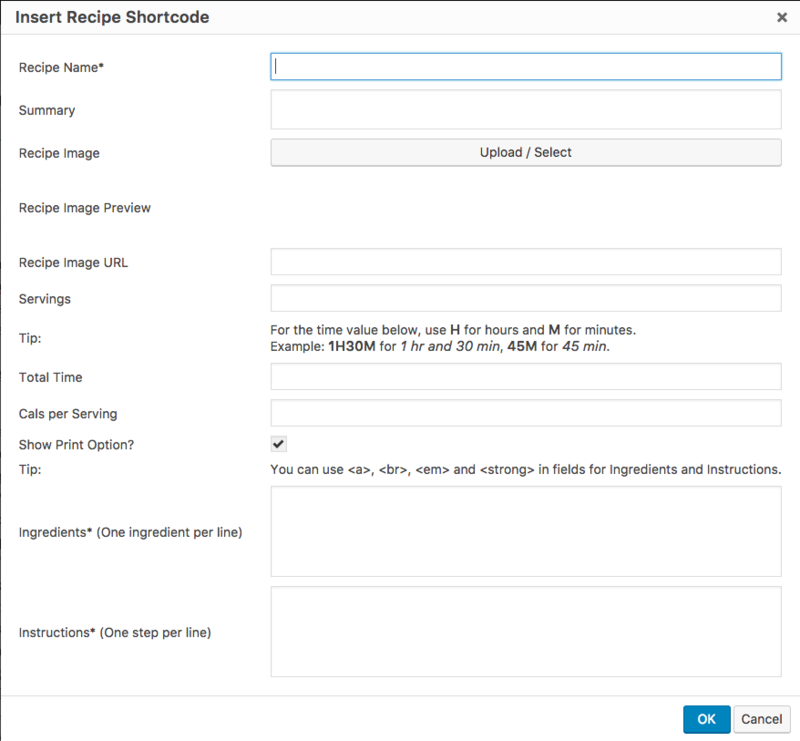 The content within the opening [lt_recipe] and closing [/lt_recipe] shortcode tags constitutes the actual recipe. Separate each step with a semi colon (;) and the shortcode automatically creates the “Step” labels for each step. You can use the built-in shortcode builder to generate the above code. Click on the “carrot” icon to launch the builder and fill in your values. Here are all the possible shortcode arguments – you do not have to use all of them. Any fields that you leave out will not be printed or used. name: Enter the name or title of the recipe. For example “Homemade Pesto Pizza”. servings: You can enter the servings information such as “4-6 people” or “6-8 medium slices”. cals: The total number of calories per serving. You don't have to provide the unit name, it will show up automatically as Cals/Serving. print: If enabled, user has an option to show the recipe in a printer-friendly version. image: A link to the recipe image. In the latest version of the theme, we've made changes so that interchanging between Kale Pro and Elara Pro is a seamless experience. All Recipe Cards and Recipe Index templates work with the same settings in both themes.